Above: First sketch in my new Large A4 Nostalgie Sketchbook with Pentel Brush Pen (pigment, squeezy handle). I adore Nostalgie. I've been sketching on it for over 10 years. I keep pads of it around. Nostalgie loves ink. And what do I love—Ink! Left: You can even paint on this paper. I love working with gouache on this smooth, smooth surface. 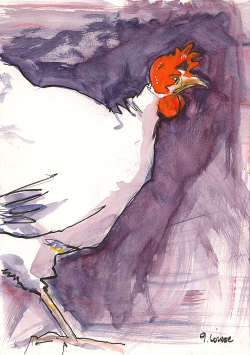 (I used the Faber-Castell Pitt Calligraphy pen to sketch my live subject (it's a little like stalking because you have to follow the chicken around the yard) and then used a 2- and 3-inch flats to brush on the gouache. I am deliberately working with light, diluted washes on this project, except for the red of that flop-over comb. Click on this image to view an enlargement. 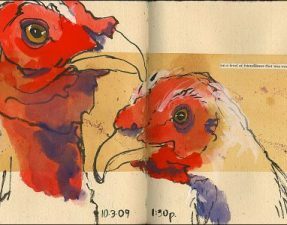 Click here to see a whole set of sketches made from life one afternoon with six chickens, a pad of Nostalgie, and some gouache. It doesn't matter which type of ink you're using or what the delivery system for that ink is—dip pen, fountain pen, brush, marker; Nostalgie loves ink. 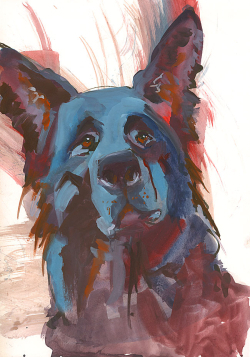 Right: See a dog portrait I sketched on Nostalgie with opaque applications of gouache. (8.5 x 11 inches). You can read more about this sketch by clicking here. In fact, their website states "The fine grain of the paper makes the pen slide over the surface virtually on its own." It's true! There is an immediacy that happens when you work with ink on this paper. There is just enough contact drag that you know you are in control, and then a whole lot of glide. Again, it doesn't matter if you're working with a scratchy-tipped dip pen or a slick brush pen, this paper has an affinity for ink and it's going to work with you. The paper feels like a lightweight Bristol when you touch it or turn the pages. If you enjoy working on illustration board or Bristol, you'll enjoy this paper too. The paper is also hefty enough to easily accommodate collage work. And don't worry—if you like to work with pencil, or you want to get out the Neo-Color IIs, or play with your ArtGraf chalks there's lots of fun to be had on this paper. I'm pleased to say the sketchbooks are HERE in the U.S. now. Wet Paint is currently the exclusive distributor so if you want one you'll need to contact them. Click here for the link on their website to these sketchbook books. For now they carry four sizes; two portrait size and two landscape size sketchbooks. Who knows, if the books sell well maybe they'll bring in all six sizes—but they have great sizes for you to choose from whether you prefer portrait or landscape orientation in your sketchbooks and journals. Wet Paint has the books priced at 25 percent off the MSRP! You can purchase an A4 Portrait for $25.50; an A5 Landscape for $17.63; an A6 Landscape for $12.75; and an A5 Portrait for $17.63. Based on feedback from today if a staff member at Wet Paint tells you the books aren't available until the holiday sale tell them you read my blog post. Darin assures me that these books are available to both online and in-person customers. So these sketchbooks are filled with great paper, what about the sketchbook itself? Let me tell you both Darin and I were holding our breath slightly while waiting for them to arrive. You couldn't tell much from the email announcement I'd received. An optimist when it comes to new sketchbooks, I was overwhelmed with joy when I saw the actual books. Above: A photograph of the unwrapped A4 sketchbook I purchased. The warm red bookmark ribbon is folded up to be visible in the photograph. Left: The debossed logo that is on the center bottom of the back cover. The books themselves are simply lovely. 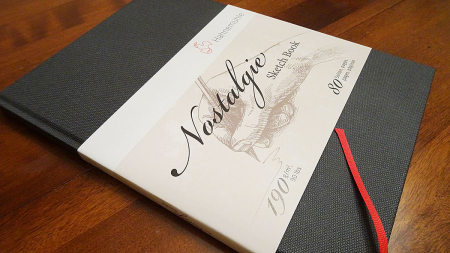 Each 80-page sewn bound sketchbook has an elegant charcoal gray hard-wearing linen cover material impressed with a herringbone texture. Once you remove the label band the book is naked except for the debossed rooster logo on the center of the back cover. While I've only just started working in mine and don't have any idea how the cover will wear over time, I know that is substantial enough to wear at least as well as similar materials used in the market. And more important it feels so good in your hand. You want to hold this cover—it isn't slick, slimy, tacky, or dusty in your hand. There are headbands decorating the head and tail of the spine of the textblock. Right: A view looking down on the headband (striped) and bookmark ribbon (red) at the head of the book. While the construction of the books is clean, crisp, and tight (i.e., not sloppy and loose) they open flat easily. This makes working across the gutter on a page spread easy to accomplish. And it means that you can easily scan works which span a page spread. You might wonder, if the smooth surface of Nostalgie loves ink so much what am I doing painting on it with wet media—well just because. You know me. I like to paint on every paper and see what I can do. Imagine my joy when I first started working with Nostalgie (in pads) and found that it loved to step up to the challenges I gave it. You may find that it will buckle slightly with wet applications, but you can still get it to scan flat, and the slight buckling that may occur (depending on how you manage your water) will not limit you from working on the reverse page of your sketchbook. Above: A sketch of an Australian Shepherd friend, Zeke, on padded Nostalgie—approx. 9 x 12 inches). Using both Pentel pigment- and dye-based brush pens. If you would like to see all the sketches made of this dog and his pack buddy during a visit with me, you can click on the link in this line. The video begins with sketches done on lined Japanese paper and then moves to these single sheets of Nostalgie. 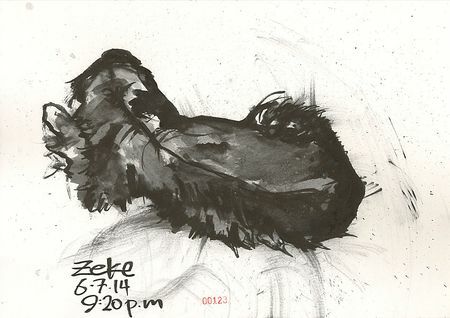 Black and white dogs are a gift of nature to artists who love ink. I know that as long as I can still get this sketchbook it will have a place in my art practice. It's a soundly made, quality book structure made with paper I LOVE. And I don't have to bind the paper myself! How fantastic is that?! This means more time sketching, more time playing with inks and paints, and more time looking about and noticing things in the world. If you also love smooth papers and enjoy working with ink you absolutely have to try one of these books. And if you love working in mixed media there are important discoveries waiting for you between its covers. I can whole-heartedly urge you to go and get one because I know you'll have fun with it. No, not just fun—joy. A whole lot of joy. 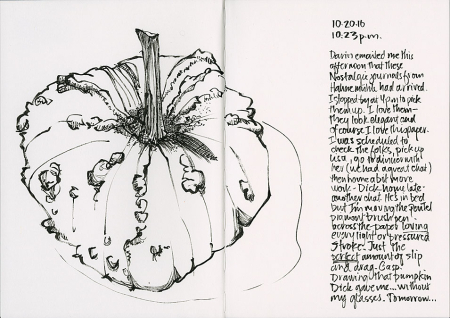 Sketchbooks should invite us, entice us, and even seduce us, to sit down with them and create. This book does all that. And I'm not going to resist at all! Disclaimer: I'm not connected financially with Wet Paint—I bought my sketchbooks. I am not connected with Hahnemühle either. I love this paper and I am over the moon about having it available in elegantly bound sketchbooks that I can pull out of their wrapping and take right into the field. 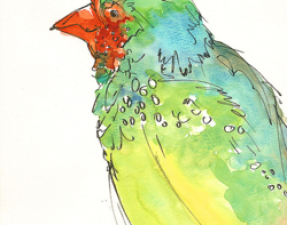 Animals Backstory Birds Elder Care Family Paper Random Thoughts Richard Roz Stendahl Watercolor Why Draw? Adventures in Eldercare: Where is CR? Roz, this is wonderful news! Hahnemühle makes some wonderful papers for digital “giclée” printing that I have used. Really? – linen cover and a rooster logo too, it’s like this sketchbook was custom made just for you :o). I have been seduced, placing my order right away. Thank you for doing all this work, and passing the info on. Julana, testing new sketchbooks isn’t really work for me. Especially when the product turns out to be so great. But I’m glad you find the information useful. Thanks for writing.